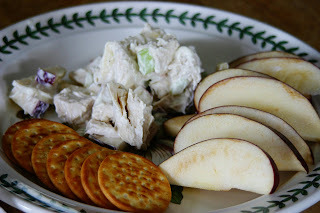 I have been making this chicken salad for over 20 years. It is fabulous but I found a trick that makes it even more delicious. First, I use split chicken breasts, bone in and with skin on. These chicken breasts will give you the most flavor. I season with salt, pepper and olive oil. 2. Roast the chicken breasts for 45 minutes at 400 degrees. I use to poach boneless chicken breast, good but a little flavorless. Roasting the chicken gives it the most wonderful flavor. 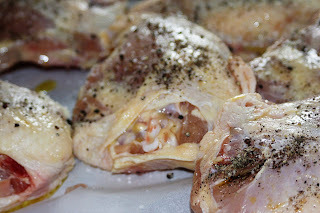 I had a great picture of brown chicken breasts but somehow I cannot find it. Oh well, let's continue. 3. 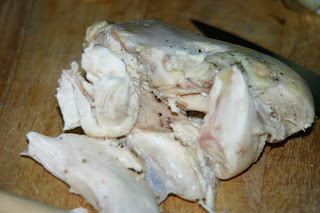 De-bone and remove the skin of the chicken. Side note: I roast chicken almost twice a month and use it for any number of dishes. 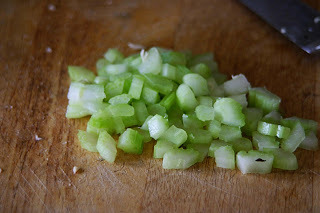 Refrigerate it and you have any number of quick dinners. 4. So once, the chicken is cool, cut into chunks. 6. 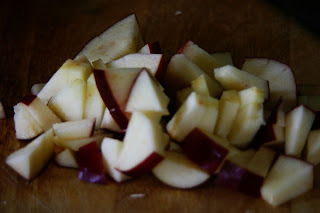 And apples. I used half an apple with one chicken breast. 7. Add mayo. Mix gently. I have added many different items to this basic recipe; pecans, walnuts, grapes or mandarin oranges. I have always gotten complements on it every time I served it for company. 2) The blog looks great -- I love it! 3) I want chicken salad! 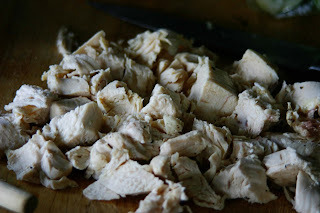 Okay, I make chicken salad all the time and have always poached the chicken!! I am now going to try roasting it first! Looks yummy!!! Thanks for the recipe and hint!! 2. i LOVE you're new blog!!! 3. I want the chicken salad.... I am eating Panera, I tried cooking noodles last night and somehow I messed it up lol!!! Cynthia, That sounds so good and I am sitting at work right now, Starving to death! I love chicken salad! I love a good chicken salad! Normally I use the good ol' can chicken, but this, I'm sure is so much better! I will be trying this pronto. Can I learn to love you any deeper? Each day it seems God gives me yet another reason we will one day be irl friends too! You are so talented, thanks for sharing!